In the latest national pet owner survey, it was found that 68% or over 82 million US households own a pet. With pets showing up on holiday cards and taking family vacations, pet owners consider themselves pet parents (hip hip HOORAY!) more than ever before. The human/animal bond has never been stronger and people want only the best for their pets. They are savvy pet parents who are reading pet food labels closely, demand to know where products are made, are active with their pets and of course want their pet to look sharp when they are on a walk. So, what pet trends should we expect to see this year? Made in the USA– yes, people have been concerned about this for a while but after so many scares in 2013 and recalls of Chinese made pet jerky, USA made products are a MUST HAVE item for our pets. Recently, we discovered Wild Meadow Farms jerky treats. All made AND sourced in the USA. Can’t beat it! Freeze Dried Nutrition– The all natural market is booming and one of the fastest growing food and treat segments is freeze dried. AND cats, who lets face it usually are second class citizens, are getting treated now more than ever. Freeze Dried food offers many of the nutritional benefits of a raw food diet, but with less mess and less occasion for a salmonella scare. We love Stella & Chewy’s for dogs and cats and Bravo makes a wonderful freeze dried line of treats for fido and felix too! The Power of Chia– chia seeds are popping up in pet treats and offer so many benefits: cardiovascular health, joint function support, digestion, detox, etc. Lincoln Bark was the first company we met who used Chia in pet treats and now we know about Savvy Beast Treats and Smart Cookee Company as well. Want to learn more about Chia? Visit Savvy Beast Treats website for a great run down! Get Out There and Get Active– This year, pets will be on the move with their pet parents. As an exercise partner to stay in shape, providing service to the community and part of daily activities. Working out? Bring your dog! It’s more fun and good for both of you. Work out facilities for pet and parents will be making their way across the country. 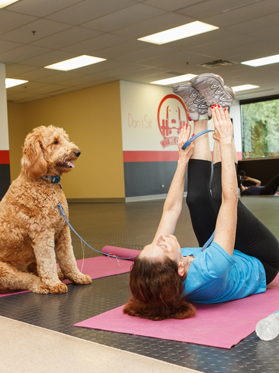 Check out K9 Fit Clubs– gyms for you and your dog! Making their way across the country. Also, join the Move Your Mutt movement at Petsmove.org! 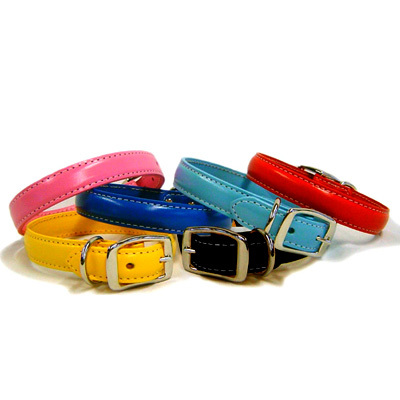 Fashion forecast– Bright colors and patterns are popular and leather is making a comeback in an elegant way. Jenn’s guess at the most popular 2014 color: Orchid! Pet fashion often follows fashion for two leggers. So look for Spring’s color palette to mimic the NYC runways. Big thanks to our friends at Downtown Dogs in Tampa, FL for hooking us up with elegant leather collars to take to the Daytime Show!